The Book of Remembrance Room is situated near the Cloister Chapel. Pages are made from sheepskin parchment and are edge-gilded with 24 carat gold. Entries are carefully executed by highly skilled artists and inscribed with the chosen wording hand-penned in black and red ink. Minimum entry is two lines with the first line consisting of the name only. With entries of five or more lines, space is available to enhance the memorial by the inclusion of a miniature work of art, such as a floral emblem, animal or bird, badges of societies and organisations, regimental badges, crests and coats of arms. We turn the pages daily to display the entries on their anniversaries. You may view entries on any day (not just the anniversary of the date of death) with the assistance of a member of staff, provided the relevant volume is at the crematorium. A touch screen version of the Book of Remembrance is also available. Any entry into the actual book will also be displayed here. Entries can be viewed for any date without the help of a member of staff. Private personalised entries are also available with this version. These entries can only be viewed after the insertion of a personal key card. Entries must follow a standard format and must be two, five or eight lines. The name is written on the first line, with the surname first. Our calligraphers can inscribe almost any kind of floral emblem or badge but please note that the entry must be at least five lines before there is room for an emblem. Copies of an inscription may be inscribed in a Remembrance Card or in a Miniature Book of Remembrance. 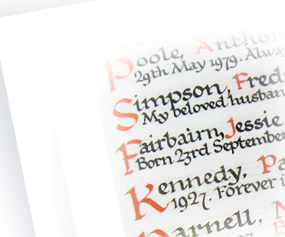 The Miniature Book and Remembrance Card are also available as separate memorials. It is not necessary to have an entry in the main Book of Remembrance.